It is always hard to take a beloved franchise and reboot it. New actors, new(ish) origin, and a fresh take on an established reality. Will audiences accept all this new? Well when the last film version was the abyssmal “Spider-Man 3” the answer is yes, eagerly. But the new still needs to capture what made the franchise work in the first place. How does he keep all of that hair in that mask? 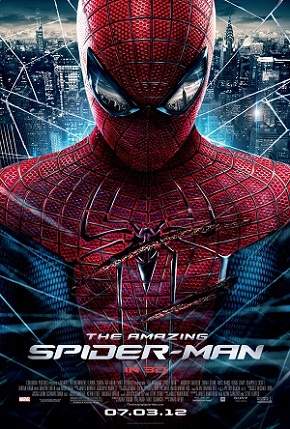 “The Amazing Spider-Man” completely restarts the film universe bringing it more in line with the comic continuity. The story concerns Peter Parker’s becoming a hero and the beginnings of his first relationship, Gwen Stacey. By design this movie erases the entire previous movie continuity and gives our new Spider-Man a fresh start. I applaud the decision to go this way, and after the exponential drop in quality of the previous films it was the only option (see the 80s/90s Batman films vs the Christopher Nolan trilogy), but my biggest gripe with this new version is how long it takes Parker (Andrew Garfield) to get moving. Fully 2 thirds of this film are Spider-Man’s origin prior to his first “adventure.” And while this slow burn approach can be effective, and indeed was mostly well done here, it’s deeply frustrating when the audience already knows every beat of the story before it happens. And I don’t just mean “comic nerds”, we all saw the last 3 movies, we know how this works. Yes this is new and different, but respecting that the audience came into this with some previous knowledge goes a long way towards speeding things along. I had the same basic issue with “Avengers.” In that case 4 previous movies had come out that were in canon for this film, which should allow for streamlined world building and yet the set up was at least half of the movie. While I recognize, ironically named, director Marc Webb had no canon to pull from and he had to establish a new Peter Parker but I think some tightening could have helped tremendously. Rhys Ifans does an admirable job as the obsessed geneticist Dr. Curt Connors who becomes the monstrous CGI creation The Lizard, our villain. The Connors scenes are menacing and dark while the FX team makes Lizzard scenes violent and threatening. Perhaps too much so as our fledgling hero takes quite the beating a few times over, so much so that the the poster even shows a beaten and scratched Peter. And, while in the Spider-Man canon Lizzard isn’t what you call A-list, the character translates nicely to film. The films’ climax, including an odd almost cameo by C. Thomas Howell(! ), through to the now obligatory post credits scene are the oddest moments of the film as they simultaneously make little sense and are so bizarrley written and shot that you almost wonder if everyone just gave up halfway through the production. Even Lizard’s ultimate plan is muddled.